So, where else can you enjoy a starry sky, reflecting moonlight, beautiful sunset and powerful lava eruptions – all at the same time??? Stromboli rules! Tutto bene! 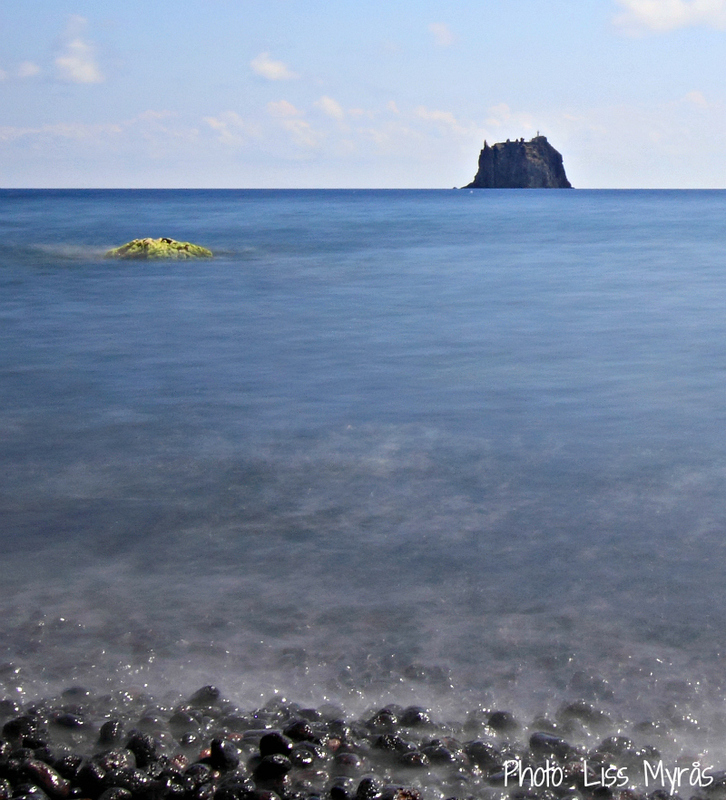 I’m finally back at the Aeolian Islands – this amazing volcanic archipelago based north of beautiful Sicily in the Tyrrhenian Sea. 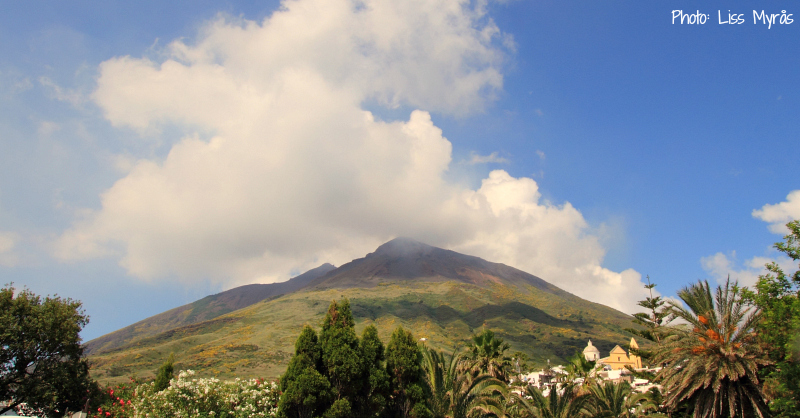 These islands have spellbound me since I visited the islands Lipari and Vulcano 4 years ago, including mount Etna in Catania. This time I once again was on a quick trip with only 3 whole days to spend on these islands, so I planned as well as possible ahead – and despite a flight delay spending 8 hours in Düsseldorf airport I managed to do what I really wanted to do thank’s to the wonderful Italian hospitality! Grazie! 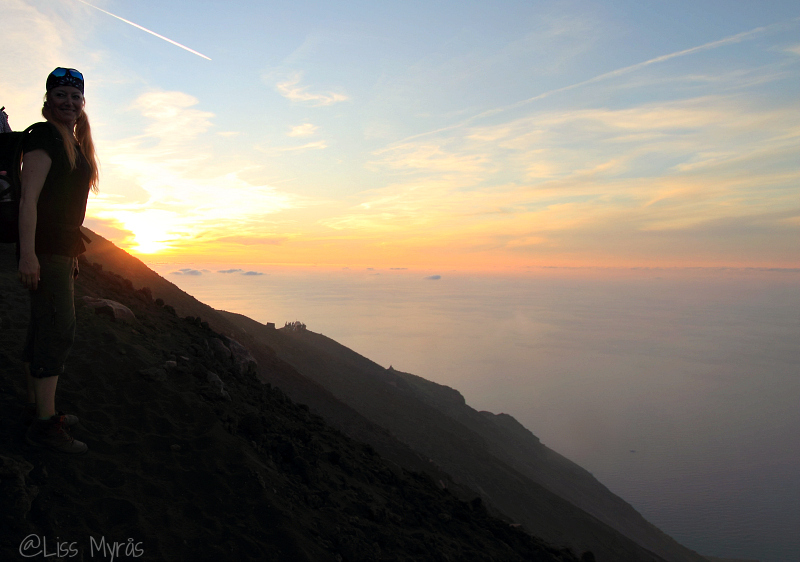 One of my dreams for a long time was a trek up to Stromboli’s craters to observe the still active volcano and lava eruptions. In the morning that day I went for a walk to the restaurant L’Osservatorio where you can enjoy a good meal(try a tasty spaghetti ala Stromboli), drink cappuchino’s or vino’s, and hear/observe Strombolis rumbling and eruptions (mostly visible at night from this place). From this restaurant you can also trek up to about 400 meters to Sciara del Fuoco view point for a free view. But if you for some reason don’t want to trek anywhere at all – you can instead enjoy a nice boat trip around the island to view the eruptions from the sea side. Top trek evening: It was not that comfortable to put on my trekking shoes in the sweaty afternoon heat, but fortunately the trek upwards Stromboli’s trail was mostly shadowed by trees and bushes – and by the time you reach the sandy and stony area the sun beams are no longer able to grill you. 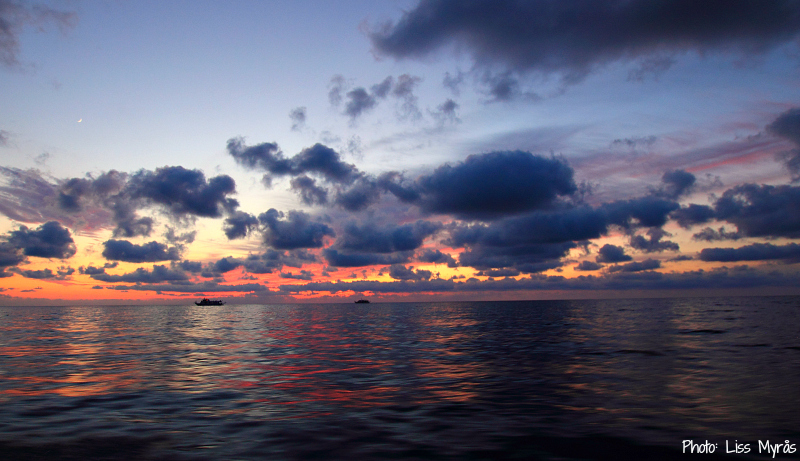 The amazing views will also make you forget anything else. 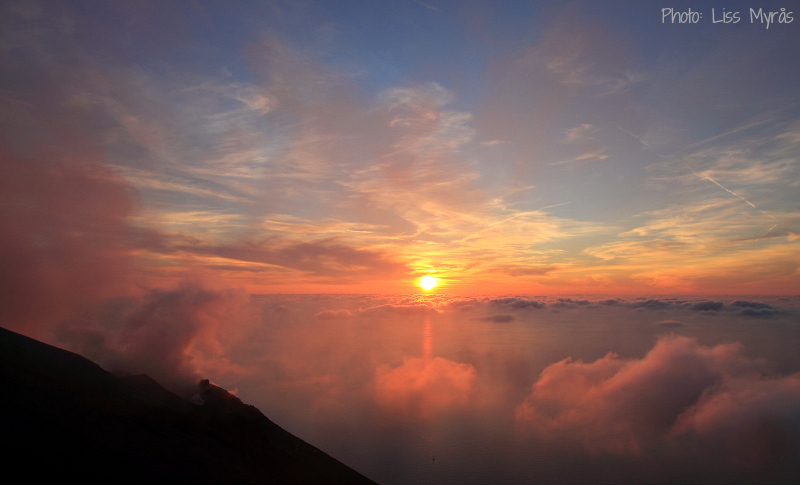 Pretty cool to look upwards and see the long zig zag serpentine trail of trekkers going upwards – Stromboli (3,031 ft) is one of the world’s most active volcanos, and also one of the most popular to visit – so you are certainly not alone up there! 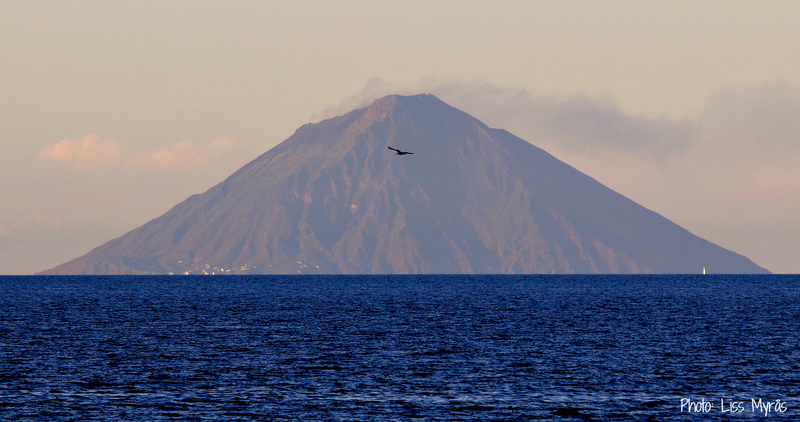 Getting close to the crater area we could here Stromboli “roar” now and then – a lil’bit like the Balrog in The Ring. Now we where above the clouds, and the ongoing sunset was absolutely magnificent scattered with clouds. Steam and black smoke arisen from the craters and mix together with the surroundings in perfect harmony. For me this is pretty close to heaven – and you also get aware of and really feel that in the end the earth is in charge! We went further up and crossed along a sandy ridge to have a good view down to the active craters. There was a bunch of trekking groups lined up along the view points, but the mood was mostly low-voiced – people just waited and enjoyed this special moment of being so near powerful forces of nature. And Stromboli did not disappoint us! The short, powerful and spectacular lava bombs/explosions occurred quick and with no forewarnings – Wow! So instead of panicky trying to catch the bursts on camera I decided to just enjoy the show instead. Weird how that feeling of being so small compared to nature forces also can be so wonderfully euphoric – respect! The trail downwards again is steep – but safe – you will walk in very soft volcanic sand and also wear a mask for protection against the fine dust, everything enlightened with your own headlamp. Ton voyage a l’air vraiment fabuleux!